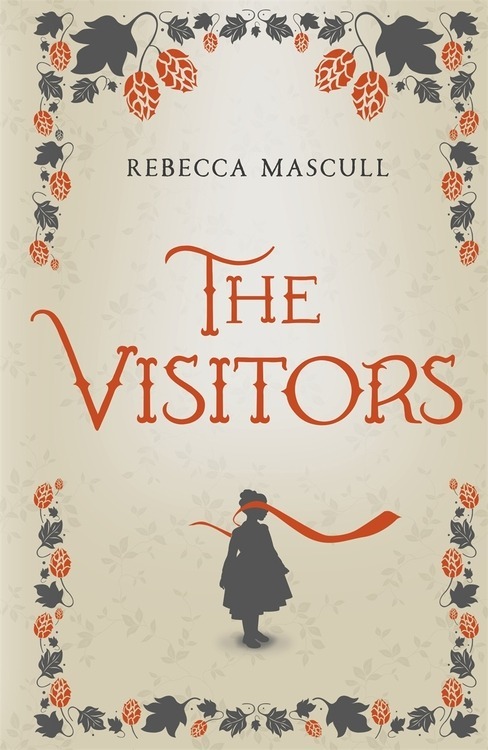 In my novel THE VISITORS, the main character’s father is a Victorian hop farmer. He owns hop fields in Kent, where his men place hop poles in the ground, then walking on stilts they string up the coir twine between each pole. The men train the hop plants to grow clockwise around the strings and spray them with soft soap to kill pests. In late summer hop pickers are hired to pluck the hop flowers, dry them in the oast house and pack them off to the breweries. 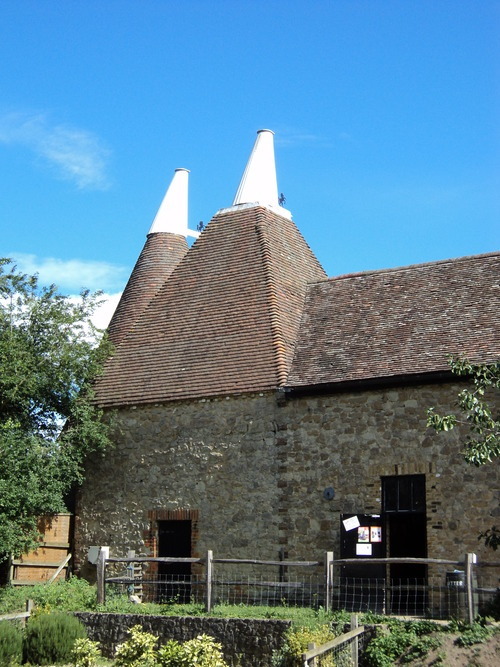 Oast houses with their unmistakeable white cowls. 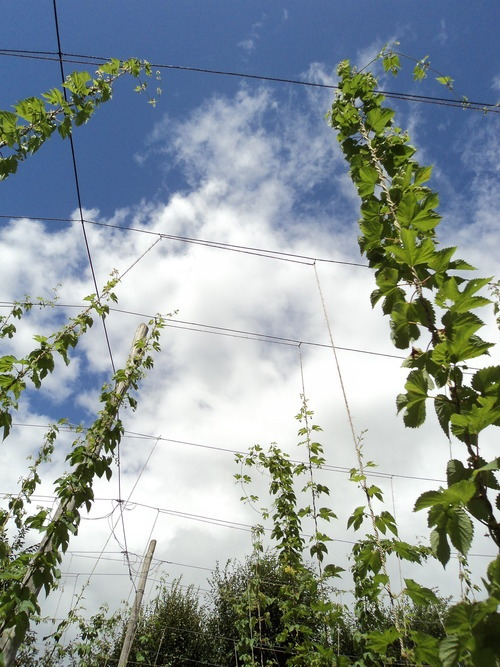 Hop farming is a profession full of picturesque sights, sounds and smells. It certainly makes an interesting choice for my protagonist’s family trade. But why hops? In my early research for the novel, I was reading a book on Edwardian social history, which examined a range of professions in the late Victorian economy. There was one chapter on hop farming in Kent. It suited my narrative needs, as I wanted to avoid the Edwardian country house aristocracy, and for the family to thrive on new money, not old wealth. Also, ideally it should be a business which was somewhat risky, where fortunes could be made and lost, that would give my patriarch something to worry about and consume his interest. As I read, I was reminded of two things: I lived in Kent from the age of 10 till I left for university. I knew parts of the Garden of England quite well, felt an affinity for it and enjoyed reading about it again. Then I recalled a school trip to a hop farm, where I’d been fascinated by mountains of hop flowers piled up in the oast houses and the overwhelming yeasty stink of drying hops, a unique smell I never forgot. I read on charmed, as even the language of hops is lovely: pipey bines, bushel basket, scuppets and green stages. I was hooked. My family’s profession would be hop farming. Soon after, I was talking to my mother on the phone about progress with the novel and I told her about the hops. Did I? I had a vague inkling, but no conscious memory of such a thing. I’d just been reading about the Golding hop! It was discovered during the eighteenth century and became a very successful hop variety, of high quality and good productiveness. Apparently, there was a story within the family that perhaps our Goldings had something to do with the Golding hop, but there was no hard evidence. So I started searching. I had never been on genealogy websites, yet my brother David had compiled some elements of our paternal family tree a while before, so I used his account and began filling in the blanks from the Golding side of the family. After weeks of investigation into the new and fascinating world of Ancestry.com and Genes Reunited, I found my way back to the early nineteenth century and James Golding, born 1st January 1810 in Staplehurst, Kent. One late night – or early morning – in the silvery glow of my laptop I finally found the word I was looking for: a tithe record from Staplehurst in the 1840s, that James Golding, his wife and his children rented a house called ‘Stangrave and Painters’ and farmed on land where hops were grown. Have a look at this website, which shows a reference to my relation James Golding farming on hop land back in 1844. This was no definitive evidence that our Goldings had anything to do with the famous Golding hop! Sadly I have never found out if they did or not, and suspect I never will. But there was a hint that in our family’s distant past, we may have had something to do with hops. I don’t know why it became so important to me to find this connection! But it did. And in the process, I found along the way so many Goldings whose stories I wanted to follow off on their own paths, if I’d had the time. One name stood out, a child who appeared in one census but had disappeared by the next a decade later. I realised that she must have died young, very young, which was sad. And her name was wonderful: Adeliza Golding. I’d found my heroine. Once I had made this personal connection with hop farming, it all felt right. My brother still lives in Kent with his family, so in the summer of 2011 my partner Simon and our daughter Poppy and I travelled down to see them all, and popped over to the Kent Life hop farm to do some hands-on research. 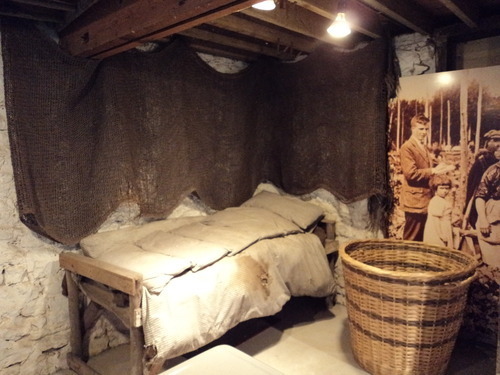 It is a super family day out, with a lot of fun activities to supplement the history. 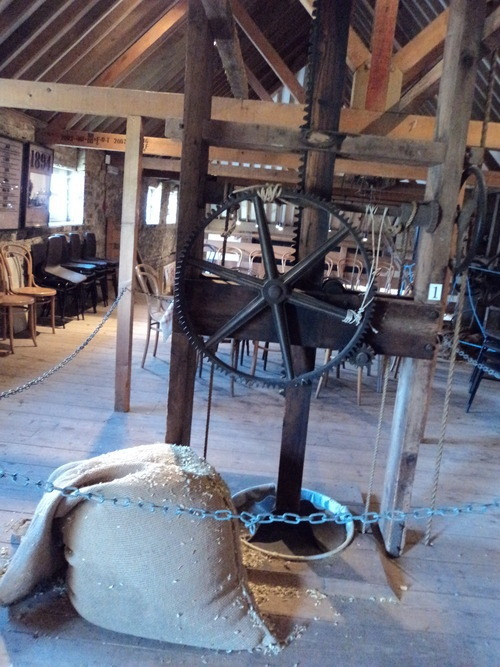 While Simon kindly occupied our four year-old in the adventure playground and the barn, I visited the extremely informative museum, saw the cooling loft, the hop fork, the Head Drier’s bed, the oast house cowls and all the other interesting things I’d been researching. 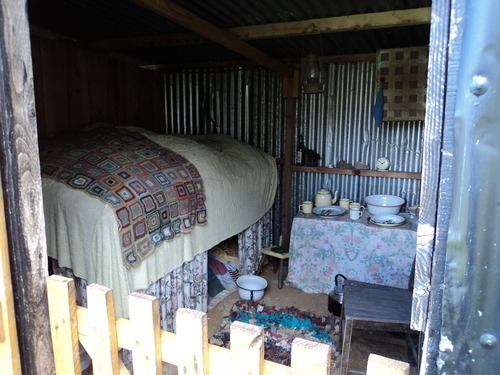 Outside I found a range of hoppers’ huts from different periods. 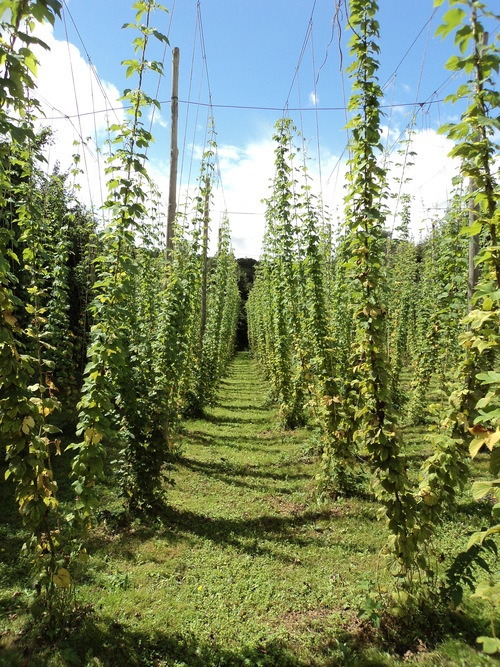 Then there were the hops themselves: gorgeous fluttering rows of bright green hop plants. I took dozens of photos and even little films, felt the soft new growth between my thumb and finger and touched the sticky stalks. All of this detail found its way into THE VISITORS, and was priceless in making the environment of the story real and concrete. I could have read a hundred accounts of hop farming (which I probably did) but there is nothing like first-hand experience of research, if you can manage it. I wish I could have been there in September when the hoppers pick the flowers and experience that heady scent of drying hops again. But my school-girl memories will have to suffice: you can’t be everywhere and see everything, as much as a writer would like to! After my wanderings, I went to find my family and we sat in Cuddle Corner and passed around rabbits and guinea pigs. I thought of how it was rather magical to be here with my family, to have strolled down the hop lanes, as Adeliza would in my novel, and perhaps my Great-Great-Great Grandfather might have walked lanes such as these over 150 years ago and seen the green hops climbing up to a Victorian summer sky. THE VISITORS will be published in hardcover and as an eBook on 16th January 2014. Rebecca Mascull keeps a blog here and can be found on Twitter here.